Hugo Chavez has forged close ties with Cuba's Fidel Castro. Will the result of the referendum in Venezuela bring stability to world oil markets? CARACAS, Venezuela (CNN) -- Venezuelan President Hugo Chavez has invited opposition leaders to meet with him and called for reconciliation after surviving a weekend recall vote, but said his opponents must learn to "lose with dignity." Election officials said 58 percent of Venezuelans voted Sunday to keep Chavez in office for the remaining two years of his term. Opposition leader Henry Ramos Allup called the vote "an incredible fraud," but international observers said the official results matched their counts at polling sites. 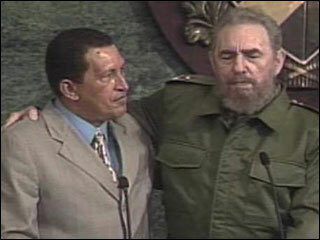 In a news conference Monday, Chavez said he would claim "victory with humility." He acknowledged that 40 percent of the country opposed him, "and they are Venezuelans too." "It's never too late for us together to build a new era in Venezuela, because as of now we begin a new era of transformation," he said. He added that he had invited opposition leaders to lunch, and they refused, but that the offer remains open. "They can still come for dinner, for breakfast or even just coffee," he said. "It's never too late. I mean this sincerely." A colorful former army officer who led a 1992 coup attempt, Chavez won Venezuela's presidency in 1998 with widespread support of the country's poor and was re-elected under a new constitution in 2000. His opponents, largely drawn from the country's middle and upper classes, accuse him of trying to steer the country toward communism and undermining democratic institutions. Chavez said his critics should learn "to lose with dignity." While most Venezuelans accepted the results of the recall, he said, some "continue distilling hatred." Venezuela has been wracked by anti-Chavez demonstrations for two years, and opponents managed to collect enough signatures to force a recall vote in June. Chavez was briefly overthrown in a 2002 coup that his supporters blamed on the United States -- an allegation Washington denies -- but returned to power within days when the opposition government collapsed. There were two reports of political violence over the past two days in Caracas. Two people were killed and 12 people wounded in a shooting by a gunman on a motorcycle in a working-class neighborhood Sunday. The city's fire chief described the man as "deranged." And eight people were wounded in a shooting during an opposition political protest Monday afternoon in Caracas, Police Chief L�zaro Forero said. Demonstrators had gathered in Altamira Square to protest the results of Sunday's recall vote, and witnesses said the gunmen carried pro-Chavez signs. Chavez said police had identified suspects and were looking for them Monday, but he suggested that his opponents were behind "these terrorists acts." He pointed a finger at opposition-run Globovision television network in particular, saying the network was "curiously always on the scene when some act of violence is going to take place in the Plaza Altamira." Opposition leaders declared the results bogus early Monday. "We will count the votes again and we will formalize before the international bodies a very complete petition to audit all machines, to count every single paper ballot and to physically examine the elements that took part of this electoral process," Allup said. "An incredible fraud has taken place." But Cesar Gaviria, the secretary-general of the Organization of American States, and former U.S. President Jimmy Carter said the results squared with their observations. Carter said his monitors conducted a quick count at polling sites and the results were "almost exactly the same as the results" provided by the National Electoral Council. Chavez called the claims of vote fraud "crazy." "Next thing you know, they're going to ask for observers from Mars," he said. Since taking office, Chavez has cultivated ties with Cuba's communist government and used the country's oil revenues to expand education, health care and subsidized food for the country's poor majority. Venezuela is the world's fifth-largest oil exporter. Chavez compared the recall campaign to an Olympic women's judo match he watched on television, in which the competitors bowed and shook hands in the end -- and mimed the bows for reporters. "They didn't destroy the ring," he said. "That's what the opposition has to do. They have to learn that you win some, you lose some." CNN Correspondent Lucia Newman contributed to this report.